Suddenly, on June 7, 1916. 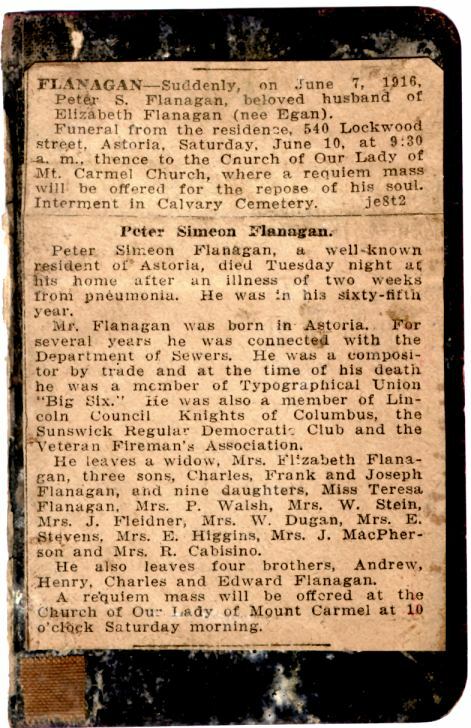 Peter S. FLANAGAN, beloved husband of Elizabeth FLANAGAN (nee EGAN). Funeral from the residence, 540 Lockwood St, Astoria, Sat Jun 10, at 9:30am, thence to Mount Carmel Church, where a requiem will be offered for the repose of his soul. Internment at Calvary Cemetery. Peter Simeon FLANAGAN, a well-known resident of Astoria, died Tuesday night at his home after an illness of two weeks from pneumonia. He was in his 65th year. Mr FLANAGAN was born in Astoria. For several years he was connected with the Dept of Sewers. He was a compositor by trade and at the time of his death he was a member of the Typograpical Union "Big Six." He was also a member of the Lincoln council Knights of Columbus, the Sunswick Regular Democratic Club and the Veteran Fireman's Assn. He leaves a widow, Mrs Elizabeth FLANAGAN, three sons, Charles, Frank and Joseph FLANAGAN and nine daughters, Miss Teresa FLANAGAN, Mrs P. WALSH [WELSH] Mrs. W. STEIN, Mrs. J. FLIEDNER, Mrs. W. DUGAN, Mrs. E. STEVENS, Mrs. E. HIGGINS, Mrs. J. MACPHERSON, Mrs. R. CABISINO [CABASINO] He also leaves 4 brothers, Andrew, Henry, Charles and Edward FLANAGAN. Jun 7, 1916, NYC Dept of Recd's & Info Services - Municipal Archives. NOTES from PF: photocopied and certified 12/97 at NYC Municipal Archives Sara E Porter also named (incorrectly) as mother on Henry FLANAGAN death certif. Usual res:      34-52 110th St, Corona, L.I. Undertaker:     Charles Weydig? & Sons, Wilhemina Weydig,  215-21 Steinway St, L.I.